February 8, 2019 – Thunder Bay, Ont. Lakehead University’s Dr. Kathryn Sinden is receiving $100,534 from the Canadian Institutes of Health Research for a study that will assist firefighters who experience post-traumatic stress injury while on the job in Thunder Bay. Dr. Sinden, assistant professor in Kinesiology, has developed a strong research partnership with Thunder Bay Fire Rescue (TBFR), the Thunder Bay Professional Firefighters Association (TBPFA), and the chair of their Critical Incident Response Team (CIRT) over the last two years to identify and address the high rates of critical incident exposure by members of this fire service. “Our preliminary data indicates that 94 per cent of firefighters in Thunder Bay experience at least one critical event over a two-month period,” Dr. Sinden said. “Out of those events, 79 per cent involved at least one or two deaths and 54 per cent involve children. These results appear to be higher than the critical incident exposure of fire services in other Canadian regions,” Dr. Sinden added. 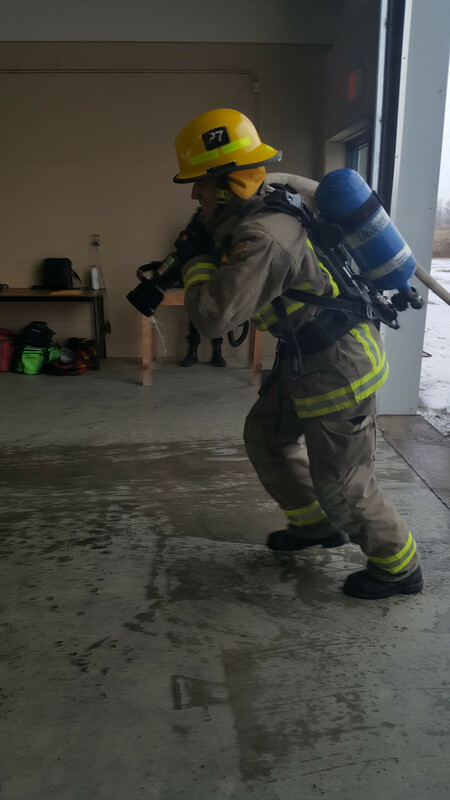 The burden of critical incident exposure suggests a strategy is needed, one that is relevant and impactful for firefighters with Thunder Bay Rescue. TBFR’s current Critical Incident Stress Management involves combined formal and informal strategies and the key components that support firefighter’s mental health is not clear. “Consequently, the overarching question developed by our team is: What are the preferred, effective components that should be maintained in the Thunder Bay Fire Rescue and Thunder Bay Professional Firefighters Association Critical Incident Stress Management program?” Dr. Sinden said. Dr. Sinden has assembled a team focused on research in Northern Ontario, with expertise in firefighting, firefighter work health, occupational mental health and qualitative methods to conduct a series of three studies. The first study will employ quantitative methods to identify the critical incident exposure and post-traumatic stress injury exposure in this fire service. The second study will involve both qualitative and quantitative methodological approaches to identify TBFR firefighters’ experiences with formal and informal critical incident management strategies. The third study will use quantitative and qualitative methods to identify the impact of implementing these interventions on the CIRT’s team mental health. For the final phase, Dr. Sinden will consolidate her findings into a report to review with Thunder Bay Fire Rescue and the Thunder Bay Professional Firefighters Association. “Thank you to Dr. Sinden for undertaking such important research and to the CIHR for recognizing and funding the treatment of trauma experienced by firefighters and other public safety workers,” said Dr. Andrew Dean, Lakehead’s Vice-President, Research and Innovation. Dr. Sinden is receiving a CIHR Post-Traumatic Stress Injuries Catalyst grant. The Government of Canada recognizes that public safety personnel – from firefighters and police officers to paramedics and correctional workers, among many others – put themselves in harm’s way to keep our communities and our nation safe. Their hazardous and volatile work environments can put public safety personnel at risk for mental health impacts and severe psychological difficulties, known as post-traumatic stress injuries. Research is needed to determine which policies, programs, and treatments will improve the mental wellness and resilience of those in public safety occupations. Today, the Canadian Institutes of Health Research (CIHR) released the results of its PTSI Catalyst Grant competition, which will provide 22 one-year grants of up to $150,000, for a total investment of $2.95 million. These grants will serve as a springboard for researchers who are increasing our understanding of how to identify, treat, and prevent PTSI among public safety personnel. CIHR also recently launched the Team Grants in PTSI competition, which represents a further investment of $8.4 million. This investment will support four-year research projects designed to develop the new research evidence and tools needed to address gaps in PTSI among public safety personnel in Canada. The results of this competition are expected to be available in March 2020. Funding from CIHR also generates support from the federal Research Support Fund to offset the indirect costs of research incurred by universities. In 2018/19, Lakehead University will receive nearly $2 million in assistance from the Research Support Fund to support the indirect costs of research, which includes costs for supporting the management of intellectual property, research and administration, ethics and regulatory compliance, research resources, and research facilities. Media: For more information or interviews, please contact Brandon Walker, Communications and Marketing Associate, at (807) 343-8177 or mediarelations@lakeheadu.ca. Lakehead University has approximately 9,700 full-time equivalent students and 2,000 faculty and staff in 10 faculties at two campuses in Orillia and Thunder Bay, Ontario. Lakehead is a fully comprehensive university: home to Ontario’s newest Faculty of Law in 44 years, the Northern Ontario School of Medicine, and faculties of Engineering, Business Administration, Health & Behavioural Sciences, Social Sciences & Humanities, Science & Environmental Studies, Natural Resources Management, Education, and Graduate Studies. Maclean’s 2019 University Rankings place Lakehead University among Canada's Top 10 primarily undergraduate universities and in 2018 Research Infosource named Lakehead Research University of the Year in its category for the fourth consecutive year. Visit www.lakeheadu.ca.